Home » Informational » Types of Foam: Different Foam Mattresses and Which is Best? Why are there so many types of foam and different types of foam mattresses available today? Which is best? Most people spend a round one third of their lives in bed – meaning lying on their mattress. Sleep is a very important factor for good health. Without adequate sleep, we are more likely to suffer from certain medical conditions including heart disease, high blood pressure, obesity and shorter life. Sleepless nights or poor sleep can also lead to mental issues. The surface you sleep on is therefore very important. Most of us have a preferred type of mattress – whether that is an innerspring mattress or a foam mattress. If you prefer foam, we have tested and reviewed a number of foam mattresses, but the variety of foam types available can be confusing. Here, we shall explain the differences between the various types of foam used by mattress manufacturers. If you prefer an innerspring mattress, you can check out our review of innersprings here. However, even innerspring mattresses have at least one foam comfort layer. The most common different types of foam used to make mattresses are latex, polyurethane, memory foam, gel foam and some proprietary foams that are usually a modification of one or more of those we have noted. Here is an explanation of each of these different types of foam along with the properties that make them suitable for sleeping on. Latex is a natural product. The raw material used for latex foam is a milky white sap obtained from certain types of tree. It is probably the ‘greenest’ type of foam with less of a carbon footprint than other types of foam. There are fundamentally two types of latex foam, known as Dunlop and Talalay latex. In the Dunlop method, the liquid soap is mixed with sulfur and a catalyst – typically zinc oxide. The liquid mixture is whipped up into the foam (just like whipping cream) and then poured into a mold. The mold contains heated rods that push down into the body of the mixture. These ensure even heating and elimination of air pockets during the next stage. The mold is sealed then passed through an oven known as a vulcanization oven. The latex is hardened when its particles chemically cross-link with the sulfur. The foam is washed to remove any excess materials. This washing stage makes sure that the foam does not further react and lose its elasticity over the longer term. The foam then undergoes a drying process to arrive at the final product. The Talalay process is different. It uses more energy to create what is commonly referred to as Talalay latex. The beginning of the process is similar to that of the Dunlop process. However, in this case, the mold is not fully filled with the foamy latex mixture – but it does contain the heated rods. After sealing the mold, a vacuum pump is used to remove air and other gases and make the constituency of the foam more even. The vacuum also expands the foam to fill the mold. When this is taking place, CO2 gas (carbon dioxide) is forced through the developing foam causing it to form a gel structure. One this has taken place, the temperature of the gel is raised to 220F which promotes vulcanization of the latex – i.e. it becomes solid. The foam is then washed and dried just like the Dunlop latex. Finally, it is frozen to stop further reaction and expansion. There are differences between these two types of latex. Obviously, otherwise why use the two types! Bounce: Talalay foam has more bounce than Dunlop foam. A Talalay foam mattress should therefore be better for young couples. Comfort: Talalay foam is less dense than Dunlop latex, which means that it can be softer to lie on than a Dunlop latex mattress. However, a lot depends on the manufacturer and you can sleep very comfortable Dunlop foam mattresses – it all depends on your personal definition of ‘comfortable’. Energy Efficiency: If energy-efficiency is important to you, the Dunlop latex wins – generally because the process is simpler than the Talalay process and uses less energy. We shall not come to any conclusion here about latex foam mattresses, other than to suggest that Talalay foam might be better than a Dunlop foam mattress for younger people. However, we have discussed only one type of foam and there are a lot more choices to come – the synthetic foams manufactured from synthetic polymers. The first is polyurethane foam (known in short as poly foam). The second is memory foam, which is a modified version of poly foam. Let’s look at a standard polyurethane foam mattress first before we discuss the more popular memory foam. Polyurethane foam is commonly referred to as ‘poly foam’. 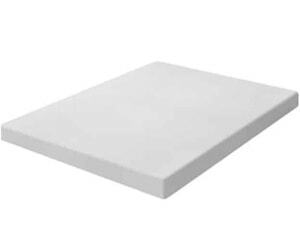 This is the most common type of foam found in what are generally referred to as “foam mattresses”. You are almost certain to have slept on a mattress made from this type of foam. It is not only common domestically, but polyurethane foam mattresses are used in the majority of hotels and motels. So what is polyurethane foam? Fundamentally, it is a foam manufactured using urethane as its backbone structure. For the chemically minded, it is a polymer that is used for a large number of purposes. It can be used to make paints, varnishes, plastics, and foams. When used in mattress foams it offers a relatively inexpensive way of providing comfort, while also being able to be used as a high-density support layer. Polyurethane was the first widely used synthetic mattress foam. It is very popular in establishments where a general purpose mattress is needed – hotels, motels, inns and guesthouses. Polyurethane is fundamentally a good general purpose mattress foam. However, when purchasing a mattress for your home, you have a choice of this, latex or our next foam – memory foam. Memory foam is a relatively recent development, and you have likely already read about its NASA connections and why it was developed. What many people are unaware of is that there are more different types of memory foam than there are of latex foam. Memory foam mattresses are manufactured using polyurethane foams that have been modified to increase its density and the way it reacts to pressure and heat. Without going too far into its chemistry, the polyurethane foam is rendered ‘viscoelastic’ – able to soften when heat or pressure is applied to it. When used in a mattress, this pressure and heat comes from your body – specifically the parts of your body in contact with it. It molds to those areas of your body that are in contact with it and rapidly reverts back to its original flat shape once the pressure is taken off it. That might be when you move in bed or when you get up in the morning. That said, there are three different types of memory foam mattress. Here is a description of each, and their relative properties. This is the original form of memory foam that became available to the public round about the mid-1990s. It absorbs the pressure of your body irrespective of your sleeping position. It cradles your body while you sleep, providing pressure point support and is an excellent sleeping surface for those suffering lower back pain and other joint conditions. Regular memory foam can help reduce joint and back pain, and provide many people with comfort while they sleep. However, some people find it too hot. Because their body is cradled within the foam, they find that the heat generated while sleeping cannot be released. They feel the mattress too hot for them, overcoming any comfort benefits it might give them. Not everybody finds this. Many people love sleeping on the original type of memory foam mattress which is still very popular worldwide. However, if you find it not to your liking there are two variants of this type of foam. Open cell memory foam is a modified form of regular memory foam, manufactured so that the cells within the foam are weaker and more open than those in the original memory foams. When you lie on this type of foam, you will find it less dense, or softer, and that it wicks away the heat generated by your body when sleeping. It is also springier than the original memory foam and springs back quicker to its original position when you take body pressure off it. When you move in bed, the mattress will revert to its original shape faster while still providing you with immediate support in your new position. Gel memory foam is believed by many to be an advance over both the original memory foam and the open cell variation. Fundamentally, gel beads are incorporated into the foam structure. The gel not only absorbs body heat but also creates an open cell structure, the two properties helping to keep you cool during the night. Some people prefer gel foam to open cell foam, though many are unsure of the difference. They tend to go with what makes them feel comfortable, and there also many who prefer the original memory foam that can provide more support for those that need it. Each of these types of memory foam is commonly in use. Each is used by large numbers of people. It may benefit you to try a test lie-down on each of the three types of memory foam before making a decision. When it comes to purchasing a memory foam mattress, you may also want to check that you get a period to test it, after which you may return if free of charge if you don’t like it. Many of the mattress vendors we have reviewed on this site offer such a test period: a 100-night sleep period is offered by some, after which the mattress can be returned with a full discount if you don’t like it. Such sleep tests do not have to involve manufacturing defects – you only have to be dissatisfied with your sleeping experience to return it! How good a guarantee is that!! Some mattress manufacturers have developed their own foams. These may be claimed to be viscoelastic or to offer properties similar to memory foam. They generally tend to conform to one or other of the foam types described above. Regarding foam construction and shaping, there are two major ways of achieving this. Convoluted Foam: The foam is shaped in an ‘egg-crate’ design – in fact, it is often referred to as ‘egg crate foam’. This design allows a high level of heat dissipation and a more even distribution of weight on the mattress. 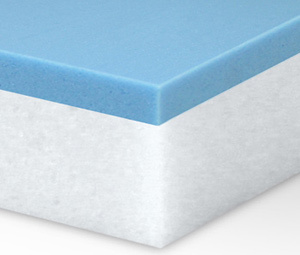 However, because of its unique design, the convoluted foam is usually found most commonly in mattress toppers rather than in the bulk of the mattress itself. It has some benefits, particularly if you have issues with your spine, but it does have drawbacks in its lack of support, particularly for heavier people. Air Channeling: Because of their structure, foams can be shaped in many different ways. 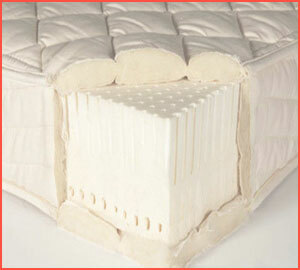 Some mattresses are constructed with multiple foam layers, each layer designed to allow air channeling between layers. As the air inside the mattress heats up, the hot air is forced out of the entire mattress by means of the small channels within and between each layer. Late foam, Polyurethane foam and Memory foam: these are the three basic types of foam used to manufacture mattresses. They also enable manufacturers to add some of the design aspects of the mattress itself. You will likely find a number of mattress foams on offer with proprietary designations, although they are almost certain to fit into one of the above categories. Some manufacturers will design their own product using a combination of the above foams and the geometry used in their construction (e.g. egg crate design) but all modern foam mattresses generally use one of those above types of foam. Even if the foam is used as a comfort layer over an innerspring core, they are each used to construct the different foam mattresses available today.